On most runs I’m wearing a Garmin Forerunner 305 GPS watch with the heart rate receiver strapped around my chest, an armband with my iPhone and on my longer runs, a Fuel Belt around my waist. The hotter it gets and the longer into the running season I go, the more anxious I get with all this gear and I want to go lighter. In the past, Nike + wasn’t a real option, because first and foremost I’m an Asics man and the foot-pod wasn’t compatible. Secondly, I didn’t like the receiver sticking out from the bottom of my iPod, it wasn’t even compatible with the armband I used. Nike has recently introduced some badly needed updates to their line which I’m excited about because it gives me two options: go light and go even lighter. Simply place a Nike + sensor in a Nike + ready shoe or tether it to the laces of your non-Nike shoes with a SwitchEasy Runaway. Next connect with an iPhone 3G, there is no need for an additional receiver since Nike + functionality is now built into the phone. 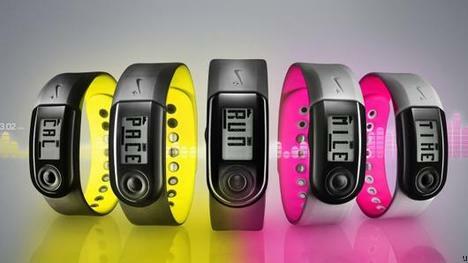 Track distance, calories, pace and time during a run or sync with gym equipment. This is an advantage over the native Garmin 305, which is susceptible to weak GPS signals from tree canopy or building interference. A separate footpod is available for $75USD, but the Nike + makes a good argument for leaving the GPS at home. If you don’t want to lug around the sizable iPhone 3G S, the Nike + works with the iPod Nano and Nike + SportBand. Available July 15th the new Nike + SportBand improves on previous versions by featuring a white background to help information stand-out and a “welded seal to improve water resistance.” When you’re done with a run, simply pop the Nike+ SportBand Link to a USB port on your computer and using the provided Nike+ Utility software. The Nike + SportBand will be available in a variety of colors including pink/dark grey, yellow/dark grey and red/dark grey and retail for $59USD.